Welcome Sisters (and Brothers!) 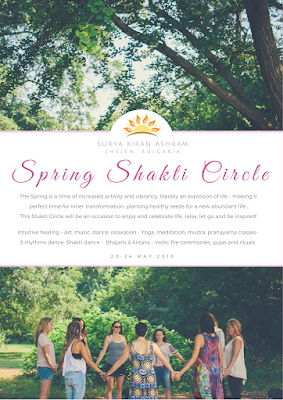 to our first Shakti Circle in Bulgaria! Shakti Circle is a way to celebrate the Divine Feminine present in all of us, share our unique gifts, experience healing, offer support and nourishment to each other, open our hearts, increase awareness, be inspired and nurtured by soft feminine energy, all this in a beautiful serene environment, offering the kind of peace you can only find in Nature. It will be a time to deeply connect with each other and share in a safe and non-judgemental environment the depths of our being. It will be a time to enjoy, to celebrate and to reflect and relax… The ashram’s focused devotional energies and the occasion of the full moon will lift up the spirit, bring forth our true nature and bring to the surface the things that need to be worked on, individually and collectively..
€225 including all activities, food and accommodation from Friday evening to Tuesday lunchtime. We have agreed on a social price, focused on sharing in the spirit of service, taking very minimum for ourselves in order to give all an opportunity to participate in this wonderful celebration. Donations are welcome, if you feel generous and appreciate the experience you receive. Surya Kiran Dham is a beautiful land of nearly 5 acres, located in the hills of Bulgaria, one hour from Sofia. At 800 meter altitude, it has the charm and tranquility of the mountains, whilst being easily accessible by flight and locally by train or car. - We are located at the end of a tiny village, and all around is mostly nature. Vast forests and tall hills spread out in all directions. - The main teachings of the ashram are that of truth, simplicity and love. They are fully embedded in the way we work, pray and play. - Just by the virtue of witnessing and living this reality one is learning a lot, to respect nature, people and all creation. Nature is also the best teacher, it teaches selflessness, generosity and balance in all aspects of life. - The buildings here are simple, wooden and clay constructions, to avoid polluting the nature with more concrete and give visitors an experience of being fully in synchrone with nature’s bio-cycles. - Visitors can benefit from ashram's tranquility and high energy created through regular pujas, homas and chanting. To book your place please contact roksana.b@hotmail.com , there are limited spaces so don’t delay! !